There are very few things I enjoy more than a jigsaw puzzle afternoon with my girls. Lara and Holly have a wide selection of children's jigsaw puzzles and we ABSOLUTELY love puzzling together either in the living room or the playroom. Holly is over the moon with this new set of four Gruffalo puzzles from Ravensburger. Ravensburger puzzles are always of excellent quality. Holly gets very easily frustrated when she is building jigsaws so it is really important that the pieces clip together easily and stay in place! This set of 4 puzzles are made from card but they are very sturdy and suitable for small hands; the set is recommended for age 3 upwards. The box contains four different Gruffalo-themed jigsaws. One of the owl, one for the fox, one for the snake and of course one puzzle for the Gruffalo himself! Each puzzle features a large, colourful Axel Scheffler illustration and a caption from the famous Julia Donaldson book - Holly finds the caption to be the best place for her to start each jigsaw puzzle. The puzzles are perfectly suited to Holly who is nearly 4. They are challenging enough to keep her interested but not so hard that she gets frustrated. Because the images are ones that she knows and loves, she has a good picture in her head of what the puzzle should look like when complete. The puzzles are shaped which adds a bit of interest as there are no corners to help you out!!! The four puzzles each have a different number of pieces - 10, 12, 14 and 16. We haven't noticed any significant difference in complexity between the four puzzles although Holly does find he snake and the owl a little harder due to the less distinct colours. 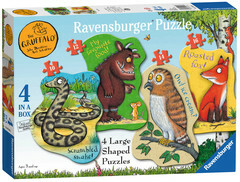 We LOVE the Gruffalo and Holly has absolutely loved this set of Ravensburger puzzles. I'm certain this will become a family favourite for our afternoons of puzzling. The only thing that could make this puzzle any better would be if the different puzzle pieces had an identifying pattern on the back (I know some Ravensburger puzzles do) to help Holly separate out the pieces for the different puzzles.